Did I mention last week how much fun these Fall bike rallies are? Here we are, in the middle of October, just coming off one of the hottest summers on record, and I am on fire. 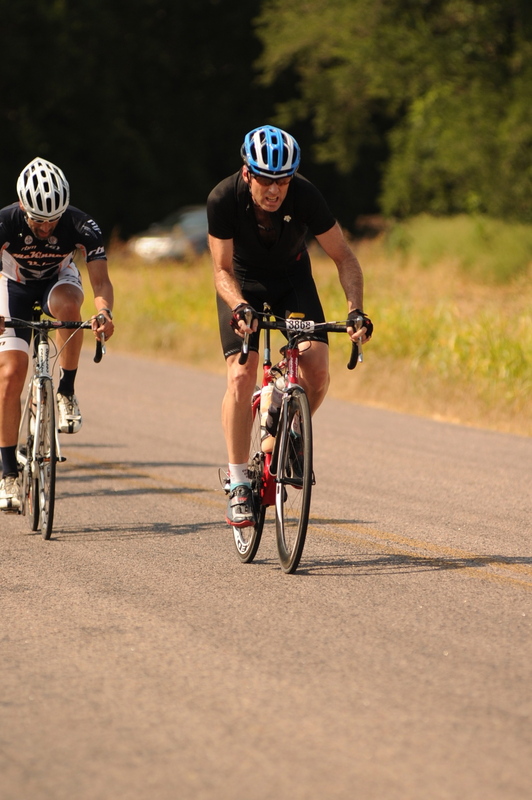 The stamina is there for a 4:40 100-miler, the strength is there for some of Palo Pinto County’s hills, and the speed is coming from that combination of cooler, calmer air, good comrades out on the course, and of course, my beloved bike, wheels, and kit. I’m serious – I think this is shaping up to be an incredible end to 2011’s year, but also will portend a great pre-season for 2012. So, with hope in my heart, confidence in my gut, and experience in my head, my newly-returned-to-cycling-from-injury wife and I drove out from Dallas on Friday evening, spent a quiet evening in Mineral Wells, and drove the 2 miles to the American Legion Post and City Park for the 8:00am start. Last Tuesday, in what can only be described as pretense & confirmation of some solid training in September, I blew my highest wattage FTP for any October since I’ve been keeping records. Saturday’s Crazy Kicker offers the option for a 65-miler as well as a 100-miler, and knowing how important the hills, the tempo, and the volume can be when applied appropriately, I opted for the 100-miler with a handful of folks, including Michael Brown, my buddy with Mirage, the Pirates of the Peloton, and TBD. The ride began with just over 300 riders, and within a mile, the entire team of studs from Colavita, including newly-crowned Cat 2 State Champ Bryan Reid, rolled to the front and set a solid pace to try and shell any early stragglers. The absolute beauty of this course comes from the relentlessness of its’ rolling, 2-3 minute hills at 2-6%. Whereas the week before in Gainesville, we had a return trip of 40K in to a headwind with 1-minute rollers at 2-3%, the hills here are longer, rounder, and the roads are more varied in their condition. One, no, two, no, THREE of my favorite race courses are out here, and over the course of the next 5 hours, we hit elements of all three. The road to Graford was the first challenge, with three fantastic 2-3 minute hills at ~4% incline. It was weird, though. ColaVita sent one rider out hard, early, on each of the three hills. Yet he would either fade or Reid and one or two others would end up reeling him in well before the crest of each hill. Reid’s another one of those just Epic Texas Cycling Studs, and the way he trained for his Championship run was enough to make any other man want to crawl in to a ditch and quiver. The man trained for Paris-Brest-Paris, held just weeks before the State Championships, and THEN he came home to win that race! It’s pretty freaking incredible! And this morning? Well, Bryan showed up on a FOLDING, PORTABLE CX bike with heavy wheels and treads! The man OOZES of HOMBRE, and he really is two different people on and off a bike, much like the captain of a 180-ton aircraft, which he is. Anyway, I stayed up front with him, two or three of his teammates, my buddy from two weeks ago with the Deamon Deacons jersey, and a fair-faced rider with a long, wispy pony tail who was a member of PACC and PBA. By the time we reached Graford, we were down to <30 riders total, but the pace had been pretty hard, and several people were just hanging on. It’s usually an unwritten rule in rallies (remember, there really are no rules, per se), that the hot dogs will partake of the longer distances, unless it’s known ahead of time that the course for that longer stuff is either too challenging, or the road conditions too poor, to make for a good ride. Now, I didn’t do that in Glen Rose, because the Ride Director warned us ahead of time that the extra miles were freshly chip-sealed, and this was confirmed by Scott Simmons, the guy I rode with on that rally, who was a local. 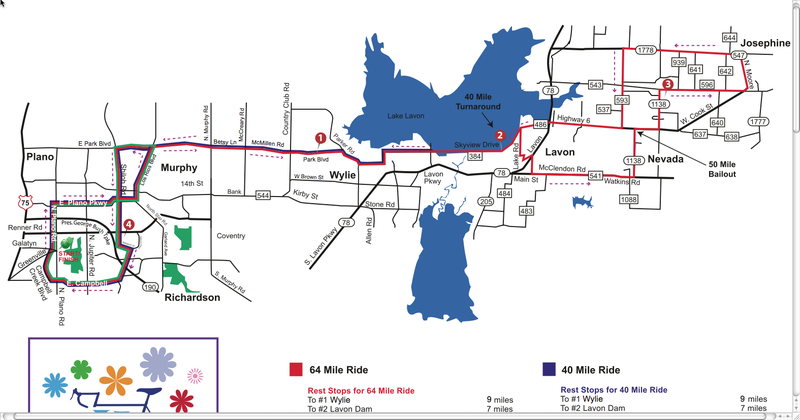 The beauty of riding the 100-mile option out at Mineral Wells is that there are bailout options between rest stops where you can cut the course to 75 and 85 miles, along Highway 16. So I was surprised when, just about 14 miles in, a TON of riders at the front, including the entire ColaVita squad, opted to head left and do the 65 miler. This left me with 6 or 7 riders, including Michael, a Bikes Plus rider, the PACC rider, and a few others. One was on a TT bike, one had aero bars on a road bike, but looking around, I saw that this could be a decent group of people with which we could attempt a quick, solid sub-5 100-miler. We quickly made friends, and headed out, rolling along at a steady pace, not really pacelining, not really rotating or pulling through, definitely getting a little separated on the hills, but regrouping on the crests somewhat. We started to see damage from the two incredibly damaging and scary fires that started out there this summer, and commented on how lucky we were to still be able to even get out on these roads, since they can actually melt in the intense heat. 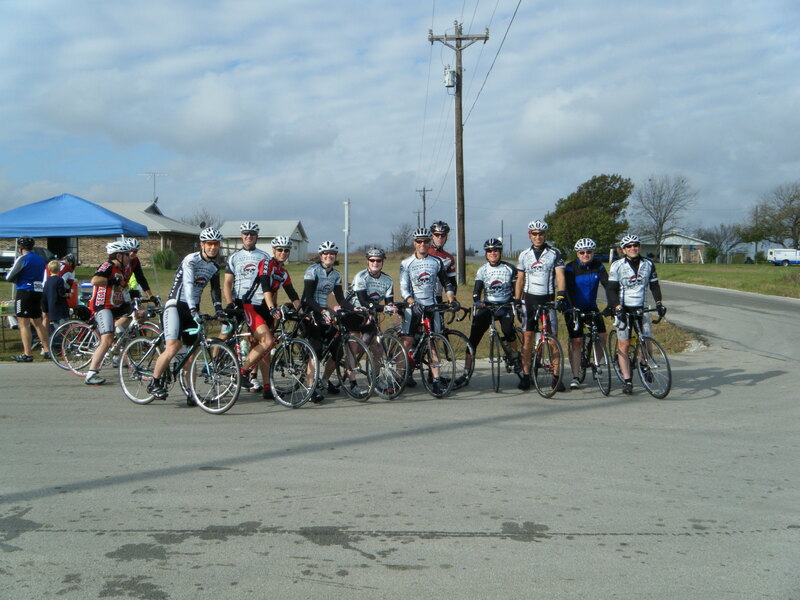 At mile 28, however, two or four riders went on ahead, while the rest of us pulled in to a famous traditional rest stop – the Home Made Cookie Stop above the Dam at Possum Kingdom Lake. The on-site resident Manager of the lake, well, their whole family, make HUNDREDS of awesome cookies for the cyclists coming through, and they are YUMMY! I figured I really should stop and eat, because, well, we WERE going to ride 100 miles and, well, as good as Clif Bars are, well, they’re NOTHING like fresh homemade cookies! So we stopped, enjoyed the view, got each others’ names, filled our water bottles, and after about 10 minutes, headed back out. Having forfeited our place with the four leaders, the goal now, at least for me, was to attempt to catch them before the end. And that would make for an incredible challenge. The hills over by “The Cliffs” resort were charred black from the fires, and the road was Grade 1 (worst) Chip Seal. By the end of the stretch, about 7 miles, we were picking up and passing a number of others who had not stopped at the Dam, but we could NOT find the leaders. The PACC rider, also named Richard, Michael and I were the only ones left, and at about 43 miles, Michael also dropped off, leaving me with Richard. Richard was originally an enigma – a mathematics professor at UTD, younger than me, I’m sure, with a relatively slow cadence, a baby face you couldn’t shave more than once a month, but the hairiest legs I’d seen in a long while. he rode a 20-year old Cannondale with maybe 8 speeds, and had old Shimano commuter-style shoes, but MAN, THAT GUY HAD SOME POWER!!!! He literally pulled over a solid chunk of the hills from mile 30 to 50, and we DID catch one of the original four riders as we entered another section of road with which I was more familiar. The turn on to that section put us back on some rough roads, and in to the wind, but we did make good time as we did what I’ll call the “Lake Palo Pinto” loop. We began to overlap the 65 mile course, catching and passing slower cyclists, but it wasn’t until we got past the bar/trading post/post office of “Lone Post”, just before the infamous “Cherry Pie Hill”, that we learned from the hanger-on that there were only two riders in front of us, and that there was no way we couldn’t catch them. This renewed my drive, and when he said good-by at the foot of Cherry Pie Hill, Rich and I both pumped a little harder, to see if we could catch that pair of ghost riders who were always just out of sight. However, that goal pretty much ended with our second stop, this one at Palo Pinto Courthouse, where the growing temperature and wind forced us to make a pit stop for more cookies and hydration. The segment of road from Palo Pinto to Graford is one that I have a love-hate relationship with. It’s short, only about 8 or 9 miles long, and it crosses back over the Brazos River, which is really gorgeous, but the road is pretty rumbly, and it comes with the dread of knowing that your LAST 12 MILES are going to be IN to the wind, going OVER the same damned hills you climbed heading OUT, when it was at least 15 degrees cooler! But those ghost riders were still out there, and every once in a while, like a desperate cowboy out on the prairie trying to decide whether what he’s seeing is a mirage or a lost calf or something else entirely, we DID see one ghost rider out there, roughly a mile or two away, at times. Rich was starting to fade, however, and if you’ve been around me enough, you know that one of my mantra’s is, “you don’t leave your wingman”. I didn’t want to leave him, knowing that we would BOTH end up going slower in the long run, but by the second-to-last hill on the return trip, when I DEFINITELY saw reflections on the horizon, he told me to go. But the mantra held true, and I gained too little, too late, and was just able to see that one rider make his left turn back on to highway 16 for the 2-mile ride back to the City Park. I pedaled as steadily as I could, finishing in a ride time of 4:37, maybe 2 minutes behind the sole rider I could see ahead. I never found him in the park, but I think it was the TT rider, as he was always visible on the climbs, but outpaced me on the descents and straightaways at the end. I think one of the most beautiful things in the world is seeing my wife find her mojo again. She was under the shade of a tree, stretching on a yoga mat, when I rolled in, and she proclaimed excitedly that she’d just finished her longest ride in about a year and half, doing 55 miles solo and enjoying every minute of it. Michael, my friend , neighbor, client and club mate, had opted for an 85, and was supremely satisfied with his own early season performance. My ride partner, Richard, met us at the Kiwanis Grill, and we all enjoyed a burger and recollections of the day. The guy was a huge part of my success on Saturday, and I gave him credit for his strong pulls, even pedal stroke, and good company. The guy we pulled to the base of Cherry Pie Hill also came up to thank us, and Amy and I departed with some strong feelings of accomplishment, love for cycling, the outdoors, the friends made out on the course, and a sense of appreciation for the work required to put these events on. We celebrated with a stop at the Mineral Wells Dairy Queen, and drove back to Dallas, where we both promptly sacked out, exhausted (but in that oh-so-great way), for a two-hour nap of which I have ZERO memory! Get out to Mineral Wells and support this rally. There were just 300 people, but it is on par with Muenster and Glen Rose for its’ beauty, its’ challenges, and the course variety. Oh, and don’t forget – you get serenaded by Elvis at the Depart, and upon your return! Can it GET any better than that? This year’s Turkey Roll was billed from the beginning as sort of an anti-rally for me. Instead of the usual ‘race-simulation’ of high intensity rides with the leaders, I decided, with the help of the Pirates of the Peloton, to sit back and enjoy a slower-paced event. We had a huge turnout of Pirates and extended family, and we rolled out at 9am with what appeared to be another record-breaking crowd. The temps were absolutely perfect for a fall ride, and the winds were minimal until the final hour of the event. Just about everyone stuck together for the majority of the event, and if we gapped people, we self-policed ourselves until we could regroup. Riders on the front were frequently in their small chainrings, and when I pulled, I rarely went over 200 watts. Due to the slower-than-usual pace for me, I ended up over-hydrating, and made two unusual-for-me pit stops to hit the portacan, but everyone used it as a chance to drink, refuel, or get in line. The conversations were lighthearted, and surrounded family, past rides, the year in cycling, and just whatnot. Along the way, we met up with friends from the Cycling Center of Dallas, including Stephanie Bassin and members of the Loncar Racing Team, and also rode with Geoff Godsey and Ian Sewalt, who were doing the entire 100k on their single-speeds and in sneakers!! GO GUYS! The Kiwanis decided to avoid a 74-miler this year, so they had us double-back on the course for the return trip. That made for more chip-seal, and some riding on busier roads, but overall, the event itself was its’ usual confidence-inspiring well-oiled machine. Signs were obvious and plenty, there were Scout Patrols and Troops manning just about every station, and the aid stations never ran out of anything. I guess the one negative comment might be that some of the intersections weren’t staffed by flaggers, but common sense always dictates caution. I actually really like it out there, and I think the gentle terrain, mixed with the wind, can make the event quite challenging. This year, however, it was all about sticking together as much as possible, helping the weaker riders, and renewing bonds on the bike. 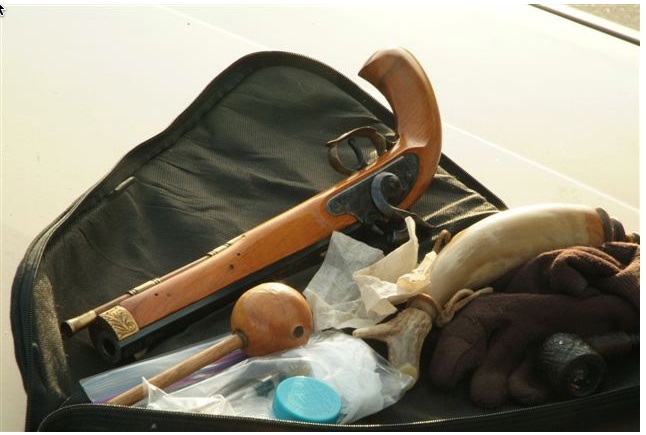 Several new people were solicited to become Pirates, and I think they’ll cross the line and join us for the upcoming season. That’s all for now – AAARRRRGGGGHHH!!! Man, oh man, oh man. Something good is really happening now!! This is one of the toughest rallies in the Metroplex. It’s a 64 mile course over terrain that EVERYONE is familiar with, and it brings out several of the Big Dogs of racing and rallying in North Texas. I decided to really try and bury myself, so I ended up riding out to the course start from home, and then doing the rally, with the intention of returning the same way, to try and make it almost 90 miles. The out part was great, but the rally itself was SO HARD, and SO INTENSE that I ended up bumming a ride home with Amy after it was over. True to form, there were a LOT of big guns there. Names I recognize, though you may not. Mike Brown, Brett Crosby, Surfer, several members of the Colavita squad, lots of Tenzingers, and Chopper. Champions among them. Top Guns. This was going to be a REAL test of my fitness. The start was hot & furious starting early, and I tried my best to stay hidden, in the teens and 20’s, but after maybe 12 miles, I found myself at the front more than once, pulling or bridging small breaks. But I found that I had some really good legs, and the recoveries were just as good. About 20 miles in, Chase McKinney (a Mirage teammate) got in to a break of 3 that got about a minute up the road. Originally, since I was riding in Pirate gear, I thought about going to the front and pulling them in, since I knew the riders were strong, but I got chastised by another Mirage rider, and I backed off. But at about 30 miles, they were all reeled in. It was then that Brett Crosby started his attacks. Brett is a super-strong cyclist, who is famous for his LONG, HARD, STEADY pulls that can rip the legs off of most people. In November, I raced against him in a 1,2,3 category race, in a blistering 25mph wind on a CRIT course… and he lapped the field. That’s how strong he is. His attacks came from the left, strong, but not too strong, in the hopes that someone might go with him and establish a breakaway. He tried maybe four times in the crosswind, before we turned left and started on the long route home, but to no avail. Then some Tenzing riders attacked here and there, and it was an attack by Joe Giordano that sent me up there with him as we tried to work together and get away from the pack. 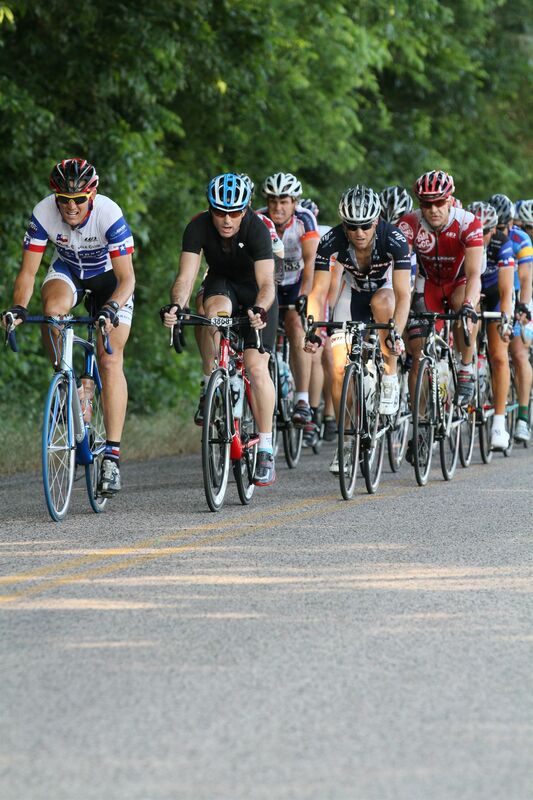 With a gap of maybe 15 seconds total, we were joined by Mike Brown of Colavita, and the race was on! This was about mile 37, I believe. We rode together smoothly, changing positions on a regular basis, and pushing up the rolling hills where we knew we could get an advantage. As we rode behind the Seagoville Federal Pen, Mike looked over his shoulders and said, “I don’t see ’em. It must be a minute.” We had a minute on the pack! It only reinvigorated me, and I pushed through Seagoville so hard that both Mike and Joe cautioned me to slow down because they were barely holding on. Our gap continued to grow, but it wasn’t until we got within 13 miles of the finish that we actually ended up seeing just how far ahead of the pack we were. It was on a section right before we dove under I-20, and as we looked across a 40-acre pasture, we could see the group just cresting a hill that we had cleared at least 3 minutes before. The pack was falling back! We were almost in the clear! Unfortunately, it wasn’t long after that, maybe with about 8 miles to go, that I began to feel the effects of the heat and humidity, and previous effort from the past 2 hours. Joe and Mike got a small gap on me on a hill (usually my forte), and I was popped off the back of the train. Then I got scared and began to worry that I’d get swept up by the pack, and my Best Finish Ever in a local rally would be lost. I MOTORED IN as fast as my wilting legs would allow, hoping that I could weave in between the other returning riders from shorter distances, and that the pack wouldn’t be able to do the same. I took risks. I raced through corners. I called out “On Your Left!” with every rider I passed, hoping that they’d get out of the way. I tried to keep my wattage above 230, then 220, then 210, then just above 200. I drank EVERYTHING I HAD, four bottles of EFS liquid shot. I never cramped, but with about 1/2 mile to go, with the final chicane in sight, I suffered from a delusion that I’ve come to recognize as my own sort of heat-related out-of-body experience. The bridge over Highway 635 (a big circle around Greater Dallas), turned purple, and the railings on both sides began to waver and wiggle like that image of the Tacoma Straights Bridge that broke apart in a high wind in the early 50’s. The bridge began to waiver and wiggle and turn purple, and I knew that I was close to needing extra help to get back home. But I recognized what was going on in my last clear-conscience thought, stood up, hammered over the bridge, made the right, then the left, and rolled under the “FINISH” banner. I had done it. I had finished 3rd in what was arguably one of the top fields of attendees of a rally in 2009. I immediately went over to the air-conditioned food court area, found some water and some coke, and then gingerly made my way over to First Aid, and asked them for a cold pack. Is it over? It is OVER! YES!! I don’t remember much from the next half hour, except that they took my bp and pulse about a dozen times, laid me down on the floor with my feet up, and gave me two cold packs to put under my arms and then one on my forehead. Maybe someone told me this. I can’t remember. I know the floor was cool, my legs were twitching, and the coke tasted great. I guess I should’ve asked for an IV, but I don’t know if they had any. Anyway, after maybe 1/2 an hour, I was well enough to get up and walk back over to the tables, where everyone was meeting and retelling their stories about the ride. I congratulated Joe and Mike, then got some congrats sent my way for doing most of the work (I tend to be guilty of that). When you ride that hard, and dig a hole that deep in your reserves, it’s hard to think, much less take care of yourself. I did make sure I drank caloried drinks, and I did have an ice-cream sandwich, but I couldn’t bring myself to actually eat anything at all. I had no taste or appetite. I might’ve retched had I actually tried. Eventually, Amy rolled in with our friend Lila, and we all recovered to the point where we could retell the tales, experiences, etc. without me feeling like I needed a bucket. Amy had driven my car out to the rally, and she gladly helped me load it up with both our bikes for the trip home. 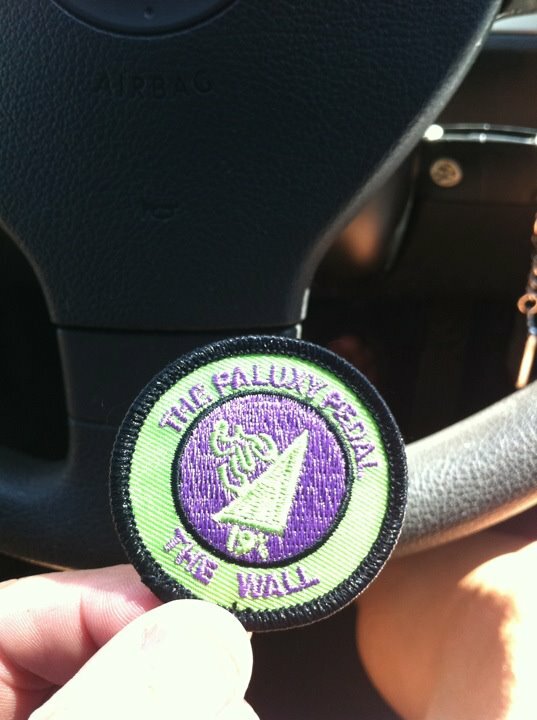 Rally riding for me gives me the opportunity to ride, hard, with people I don’t normally get to ride with. It gives me the ability to gauge myself against others, continue making friends, and honestly, it validates (or doesn’t validate) my own training plan. I ‘beat’ some really good riders that weekend. I’m hoping that some day, with accomplishments like these, I’ll earn their respect. I mean, I’m getting it, certainly, and I’m really grateful for the opportunities that Rallying has given me, but I just hope that the next time some guy starts thinking about finding ways to get better, finding ways to improve, he or she will think about “onlinebikecoach” and give me a ring or send me an e-mail. 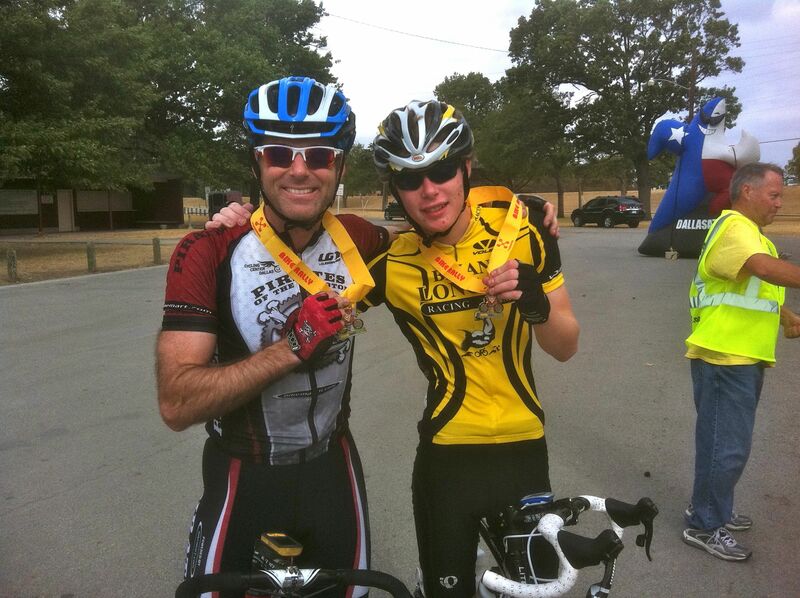 I think some of the events we do in North Texas produce some of the strongest, toughest riders in the country, age group or otherwise, and I’d like to be a part of that continued contribution. This was a hard rally, performed at high levels of energy and wattage, and it left me feeling pretty prepared for the upcoming stage race in Oregon. It still took me about 3 days to recover, but on Monday, I performed a 20MMP on my road bike, and blew a Season-Best 309!!!! So this really is working. I can’t WAIT for Oregon!! Thanks for reading – I’ll try to post some final pre-Oregon thoughts up here soon.